Get ready to bend your brain just like you'll be bending and twisting your Riddle Cube in an attempt to match the pictures on the cards with the shape your cube is in. Fun for almost all ages, you'll be racing against the timer to see if you can complete the challenge on the cards. Uniquely different from other games, Riddle Cube comes with four reusable cubes that you'll be surprised as to all the different shapes you can make. Learning how to play Riddle Cube is a snap and won't take you long to get playing. Alternate game rules and also available so you can change things up next time you play. Riddle Cube is a fun game that you'll want to make sure you have. The goal of the game is to be the first player to collect 5 challenge cards. If you do you win. 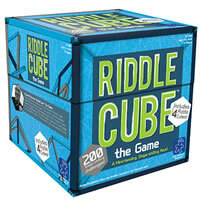 This game comes with 4 riddle cubes, 100 double-sided challenge cards, a 60-second sand timer and the official Riddle Cube game rules and instructions. Please keep in mind that the official Riddle Cube childrens rules and instructions could be different depending on the game version you have. The rules below are some of the exact directions on how to play Riddle Cube. Share with us your comments, funny stories, tips, advice, strategies, creative ways to play, questions about how to play, problems with the rules or anything you want about Riddle Cube. All submissions will be reviewed within 24 hours. Click here to add your Riddle Cube comments.